A good financial analystThe Analyst Trifecta® GuideThe ultimate guide on how to be a world-class financial analyst. Do you want to be a world-class financial analyst? Are you looking to follow industry-leading best practices and stand out from the crowd? Our process, called The Analyst Trifecta® consists of analytics, presentation & soft skills needs to be a master of dashboard creation in Excel. It’s not always a skill that comes naturally to people, and practice combined with good training is the key to success. 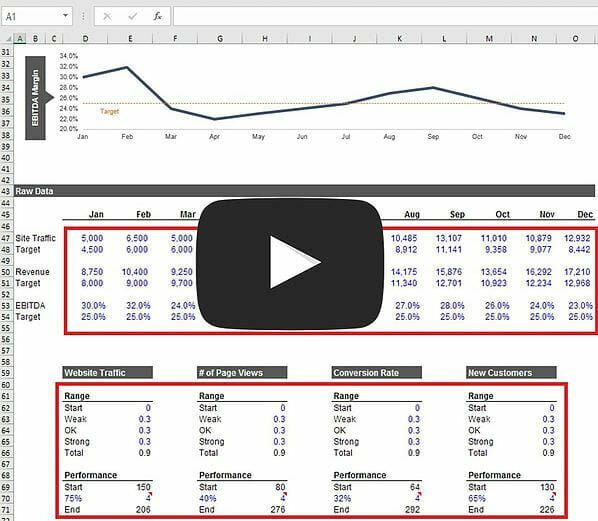 In this free guide, we’ve outlined the most important tips and tricks for creating a dashboard in Excel. Whether you are a beginner or advanced, you will find some important takeaways in this tutorial. Before you begin your dashboard creation in Excel, it’s critical to have your data well organized. We always encourage analysts to use Excel modeling best practicesExcel Modeling Best PracticesThe following excel modeling best practices allow the user to provide the cleanest and most user-friendly modeling experience. Microsoft Excel is an extremely robust tool. Learning to become an Excel power user is almost mandatory for those in the fields of investment banking, corporate finance, and private equity., whether building financial models or preparing to design a dashboard. The most important part is to have all the information you plan on graphing in one area. It can be very hard to link the graphs if data is spread out throughout the spreadsheet. In the image below you can see an example of how to neatly organize your data from the financial model to be ready for the Excel dashboard. Once your data is organized, it’s time to setup the page. The orientation can be landscape or portrait, and the size will depend on the output you’re trying to create. The most common is to make it an 8.5” by 11” page so that it can easily print to paper or PDF in a standard size. Typically, dashboards are only one page, but you can easily create a multi-page dashboard as well. To learn how to do this, see our free xl tutorialFree XL TutorialThis xl tutorial will give you all the training you need for Excel, it's settings, formulas, and functions. This is a free xl tutorial course online course. Important things to consider when setting up your page include: will the dashboard be emailed or printed, will it go to executives or lay people, is it for internal use or external use, and should the information be mostly visual or contain numbers and words as well. For the purposes of this example dashboard, we will be using a 1-page 8.5 x 11 portrait page setup. It’s nearly impossible to design a dashboard right on the first try. You need to brainstorm, experiment, and tinker to finally come up with a great design. This step usually takes several iterations, and you may even find yourself continually changing and updating your Excel dashboard based on the feedback you receive over time. Below is an example of some brainstorming that you can do before you actually begin the dashboard creation in Excel. Notice that it’s mostly just rough notes and ideas about how the page should be structured, and what type of data needs to be included. In the planning stage, we also recommend looking at other examples of dashboards to see what you like. There are lots of visual options when it comes to designing a dashboard. 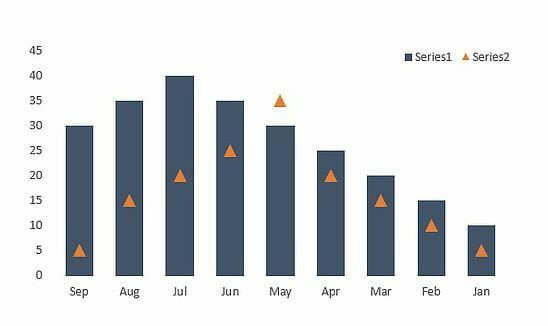 In our course on dashboard creation in Excel we go through all the various types of charts and graphs you can design in Excel, following our simple step by step approach. 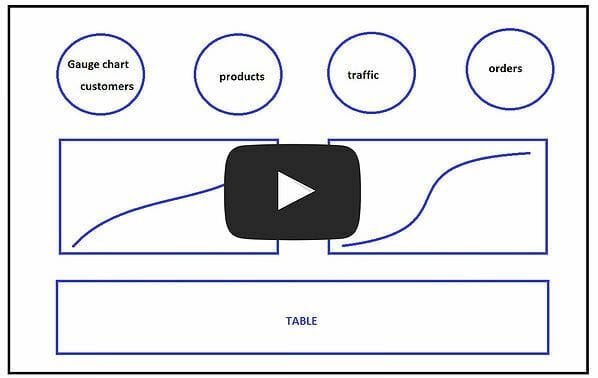 Learn how to build these charts in our Excel dashboards course. 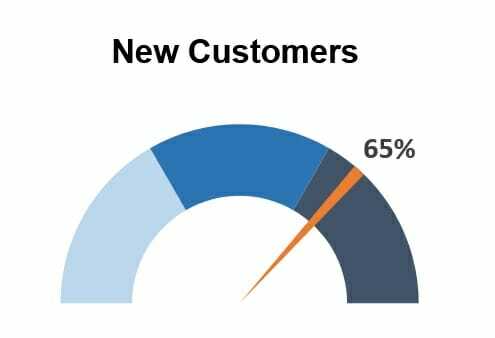 Learn how to create these charts in our course on building an excel dashboard. Once the charts are in place it’s very important to focus attention by adding attributes to the graphs. These attributes include arrows, comments, lines, boxes, or anything that pops out from the screen and grabs your attention. This is one of the most important and yet most frequently overlooked steps in designing a great dashboard. Here is an example of how to focus attention with a line and a callout. 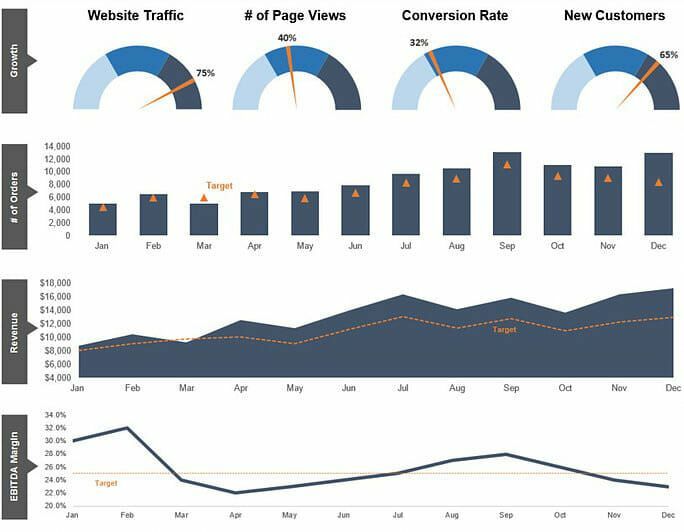 Get this chart now in our course on how to create a dashboard. The last step is to review your final product and make sure it tells a compelling story. Is it painting the picture you want it to? This is when you step back and take a bird’s-eye view of your data, the key messages, and compare that to the original purpose of the dashboard. If it’s not telling the story you want to tell, consider redesigning it, changing the data, or doing whatever is necessary to get your point across. We hope this has been a helpful CFI guide on how to build your own dashboard. CFI is the official provider of the global Financial Modeling & Valuation Analyst (FMVA)™FMVA™ CertificationThe Financial Modeling & Valueation Analyst (FMVA)™ accreditation is a global standard for financial analysts that covers finance, accounting, financial modeling, valuation, budgeting, forecasting, presentations, and strategy. certification program, designed to help anyone become a world-class financial analyst.